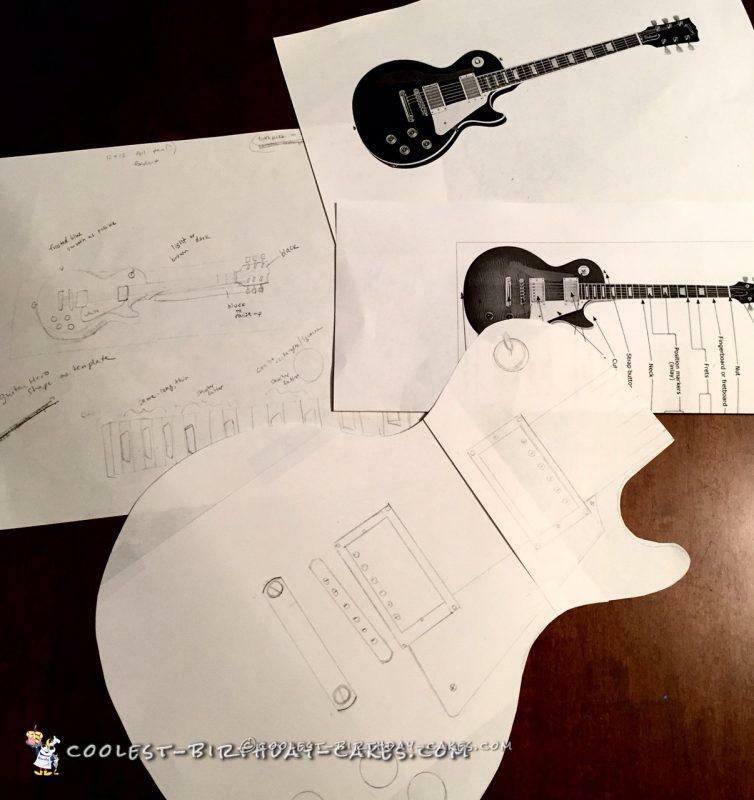 Two days ahead of the party, I made a template by tracing around a Gibson Guitar Hero guitar that we have at home. I needed to reduce the size just slightly so that the body of the guitar could fit in a 14 x 10 pan. 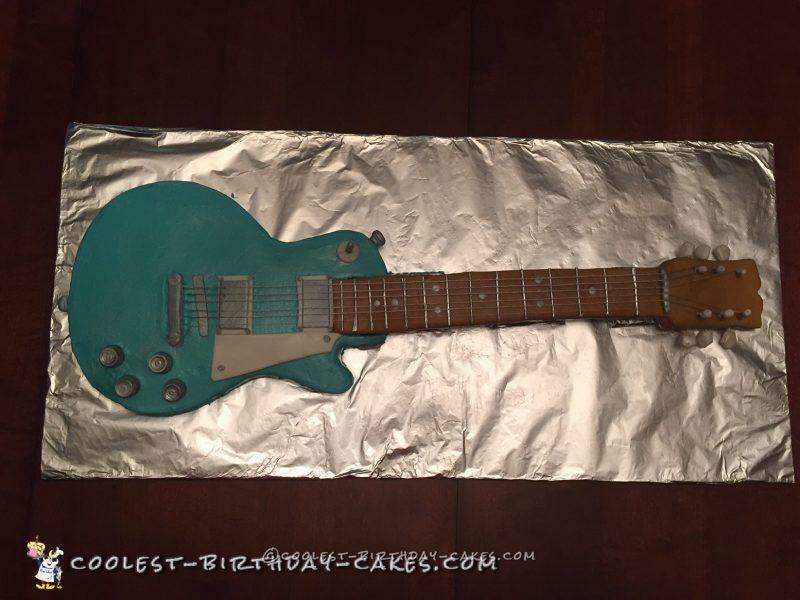 I baked the cake and froze it overnight to make it easier to carve the body of the guitar. I also made marshmallow fondant 2 days ahead to make sure it had proper time to chill in the fridge (it was 90+ degrees outside and my kitchen was HOT even with A/C). The day before the party I frosted the cake with buttercream frosting. I wanted to give it time to ‘crust’ but unfortunately it kept melting when I took it out of the fridge. 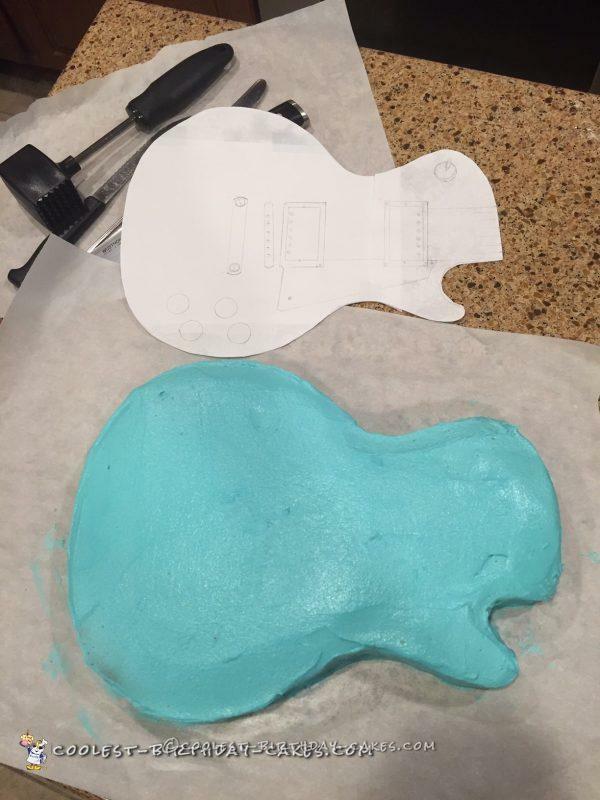 I made the neck and headstock of the guitar with Rice Krispie treats. 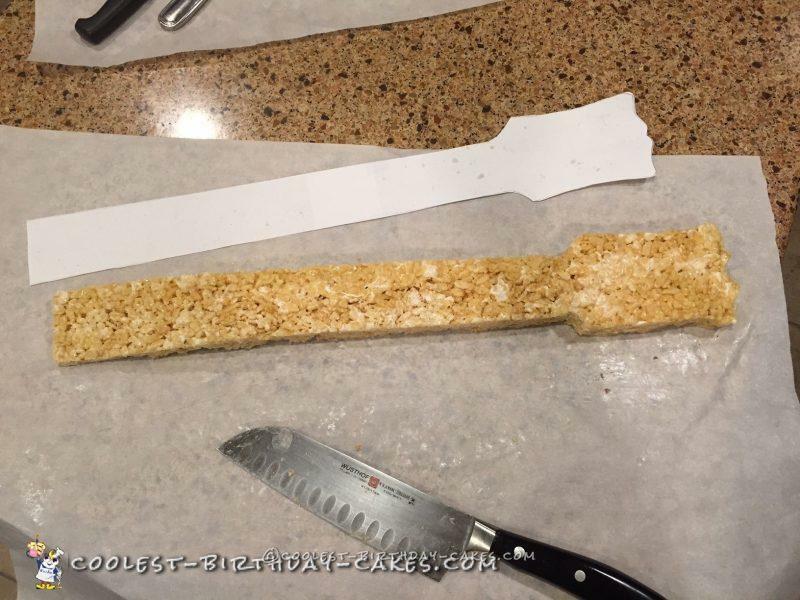 I simply poured the hot marshmallow/krispie mixture onto a long sheet of parchment and formed one long, narrow rice krispie bar using my hands and parchment. After this chilled for a few hours in the fridge, I used my template to cut the it into the neck and headstock (see photo). I covered the neck/head with fondant that I had colored brown. I made all the various guitar parts (pick plate, pickups, bridge, tailpiece, tuner knobs, position markers, strap buttons, screws, etc.) in fondant and colored some parts with Wilton Color Mist in silver. I used Wilton pearl dust, too, for touch-ups. I kept all the prepared parts in the fridge overnight. The day of the party I assembled the cake onto a foil-covered board that my husband had cut out for me (13 x 32 in.). I had to cut out a section of the guitar body to fit the neck inside. I also had to prop up the neck to the right height. I used foil-covered lego blocks for this. The tone knobs are Rolos covered in pearl dust. 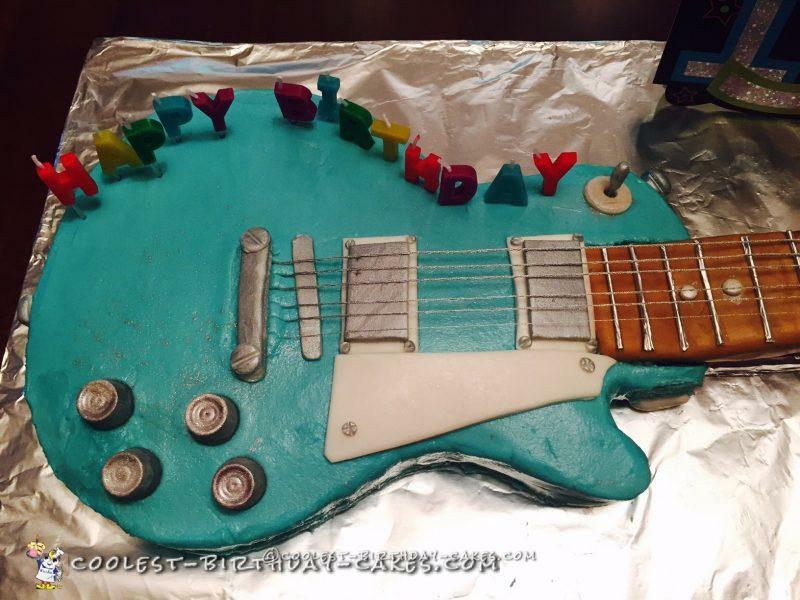 The fret bars and strings are NOT edible. 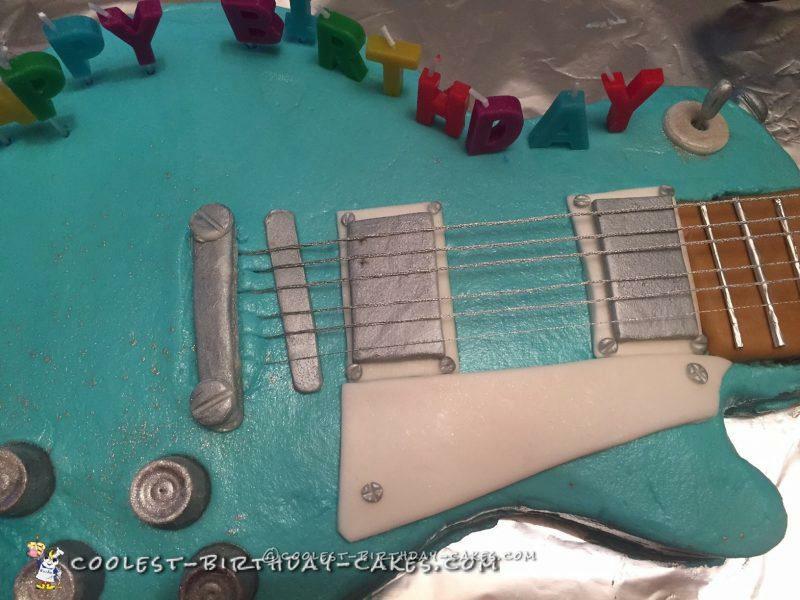 The fret bars are foil-covered toothpicks and the strings are metallic embroidery floss (as suggested by previous bakers). 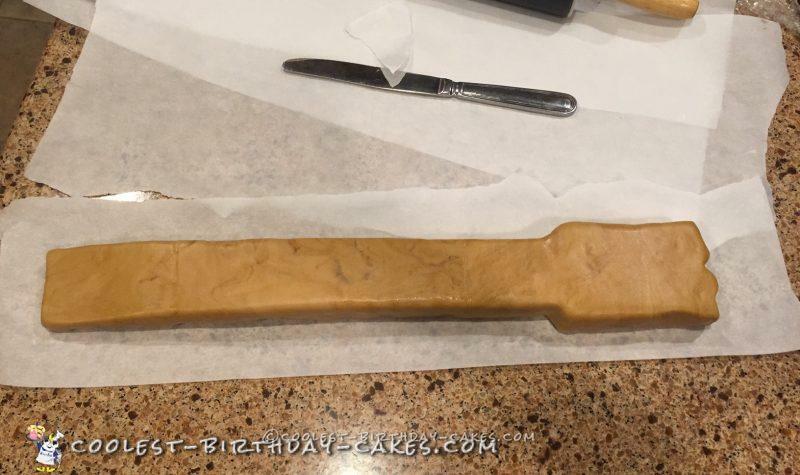 The strings were inserted into the fondant tailpiece with toothpicks and then strung into the bridge and toothpick tuners (I got them tight by twisting the thread around the toothpick). The rice krispie bars were a nice, solid base for inserting toothpicks. This cake took me about 10 hours total over 3 days but it was well-worth it! My 13-year-old son and his friends LOVED it. Birthday cake idea posted by Andrea S.